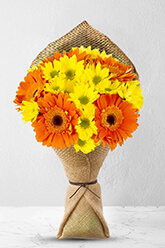 The colours of sunrise will last all day when you send this bouquet of beautiful orange and yellow Gerberas and Chrysanthemums! Add a vase to this bouquet and prolong its stunning beauty!The vase in the picture is not included, but to better personalise your gift, you can select a vase to be delivered with your order. Choose between 3 vases; standard, premium and superior. The Premium vase is the ideal selection for Daybreak. The package arrived on time and the arrangement was wonderful. Thank you. Very happy (well, my mother was-she got them) with the Mothers Day flowers. Thanks a lot! Lovely flowers delivered on time. Easy to use website; flowers delivered same day; recipient said they were beautiful. Thank you. Always delivered on time. Long lasting flowers!